My Mini Moke has a severe clunking coming from front left when it hits a rut/pothole etc. The clunk seems to be at the bulkhead . Any suggestions to what I should be looking for when I stick my head under the wing? Last edited by Doug G on Thu Apr 17, 2014 19:18, edited 1 time in total. A sketch or drawing with references would be welcome. The noise is on the engine compartment side and seems to be around the plate where the steering wheel would be if it were a 'left' hand model. That would be from where the engine steady is bolted to the body. It's likely that the body has cracked under where the mount has been bolted on. Common problem. 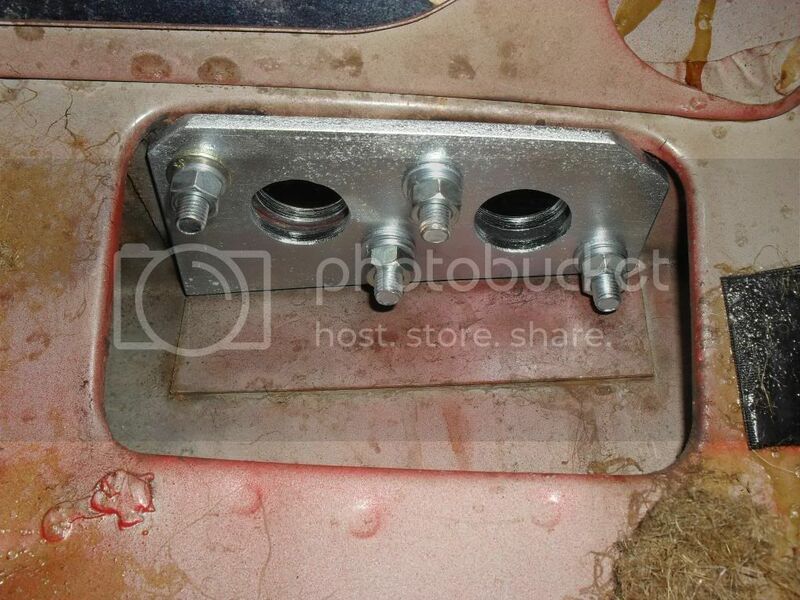 Some people have had success with getting on old pedal box, cutting away most of it, leaving just the section with the studs and the front 'ears' (that bolt up to the firewall), bolting that up from underneath. spider wrote: That would be from where the engine steady is bolted to the body. It's likely that the body has cracked under where the mount has been bolted on. Common problem. Glad to know it is just not mine. Tried replacing both upper engine steady bars - with fancy new DSN billet alloy ones I grabbed last time I was back in Blighty - look superb when fitted - didn't solve the problem though. I have two new bottom bars to fit so will have a look when I get some ramp time. Part of my noise challenge I am sure is my four-core rad hitting the inner-wing cowl - am I missing something in terms of a seal or a connection one to the other to stop this happening? The problem that Doug had and that I described was not actually the steadies themselves, but where the LH one is bolted to the body and the crack of the body from it being there (poor design). Noises can be quite hard to sort over a forum! Thanks Spider - I do have an issue with the mounting of the nearside bulkhead-end steady - previous owner has welded on a bracket with something that bears a close resemblance to pigeon droppings - I'll have a closer look at that this evening. Any thoughts on the Rad issues? BillM wrote: Part of my noise challenge I am sure is my four-core rad hitting the inner-wing cowl - am I missing something in terms of a seal or a connection one to the other to stop this happening? Some models have a strip of foam that covers the gap between the radiator and the cowl in the inner wing, but it doesn't do anything for the noise. There is meant to be some clearance between the rad and the cowl - if there isn't the cowl will eventually chafe a hole through the softer metal of the radiator. Often over time, the gap ends up closing up. It can be quite fiddly to get everything sorted out so that the clearances are OK. I had a lot of trouble with it on my Traveller, the fan was hitting the shroud and the radiator was all out of alignment with the cowl. I had to bend the lower bracket to get it right, but I reckon had the radiator in and out at least 10 times, fiddling and adjusting things. BillM wrote: Any thoughts on the Rad issues? Tim has covered the 'seal' regarding this. Your Radiator maybe touching the body cowling, they are a cosy fit for sure. A simple check on the raditaor, though not necessarily conclusive is to simply grab the radiator by the header tank then shake & shove it every which way. Have a good look at the lower cowling while doing this as they do crack. The other thing to keep in mind is if the Engine Steadys are not 100%, then these will allow the engine - with the radiator - to move and may allow the radiator to contact the body and even the subframe tower. When i first got the pleasure of my Aussie moke i found that nearly all the bushes and rubbers had deteriorated quite a lot due to the time that they had been on the car. I found that everything that held the engine "steady" in the engine bay whether bush or rubber wise needed to be replaced. When i started replacing the bushes and rubbers it showed up other that also needed replacing. All i will say is that after the work it was a lot smoother and more pleasurable to drive. I think that what i replaced was probably the original s from when the car was built in 1978 i replaced them in in 2007!! well worth doing. i also fond that the pot joint was missing all but 1 ball bearing as well. I love my grandfather really he owned it before me!! OK - interesting day in the garage yesterday……. No obvious movement on the engine, however I read up on engine steadies, and I fitted left and right lower steadies that I had as complete kits from MiniSport in Adelaide. When I set out my stall to do this job I was absolutely convinced I had also had delivery of a pair of new engine mounts - but can I find them?! Its slightly better, in that there is now no noise resulting from power on/power off which is an clear improvement. The clunking on bumps is still there and I will probably have to get the rad off to have a detailed look at the shroud and the mounting bolts. I now have a new noise however - there must be something rubbing or fouling once per revolution of some component - this is going to be a tease to find single handed!